How to get there: The nearest big cities are Grenoble, Torino and Geneve, the latter two having international airports. 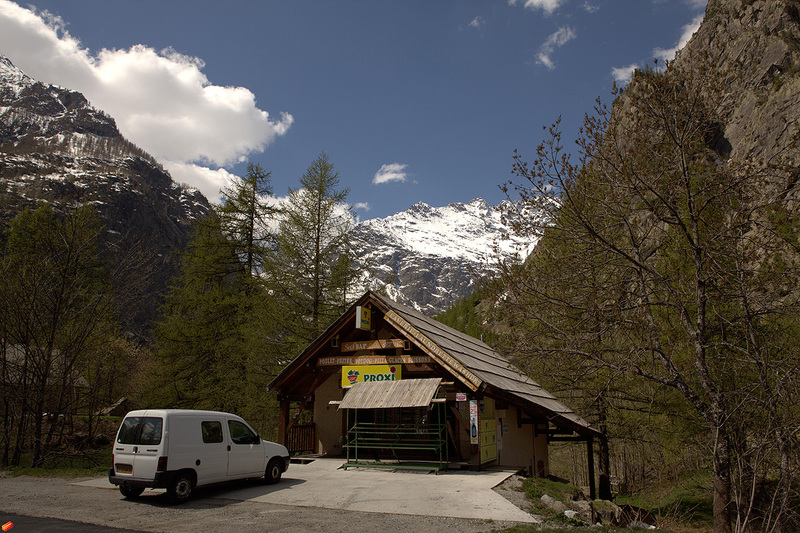 The closest city of some size is Briancon, near the Italian border. The distance from Geneve to Briancon is about 250 kilometer and about 3 hours of driving. From Briancon, drive south on Hwy. N94, and fork right onto Hwy. D4 (signs for Pelvoux/Vallouise) after approximately 7 kilometer. After 11 kilometer, you should go more west and north-west, leave D4 and follow signs for Vallouise. 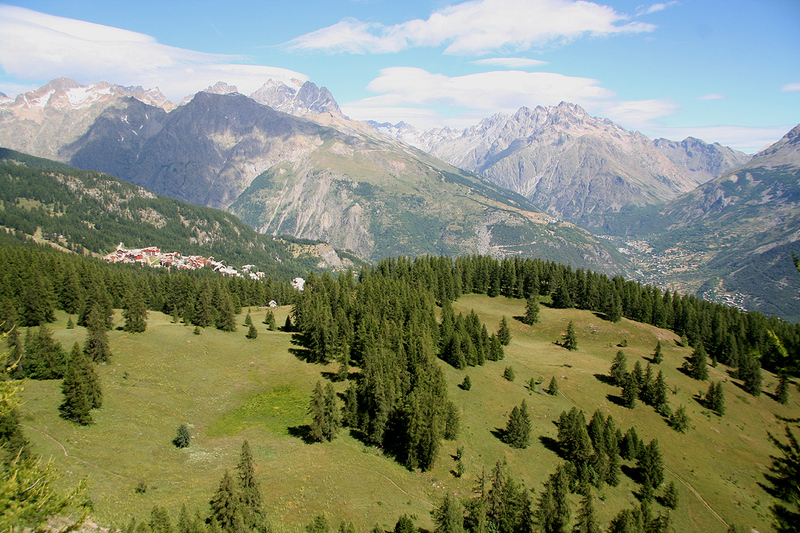 Continue up the valley, drive past Vallouise and to the very tiny place called Ailefroide. From here, a paved, but narrow road continues up the valley to a large parking area named Pré de Madame Carle (about 5 km beyond Ailefroide). Park here, this is the trailhead. Location N44:55.010, E006:24.912, elevation about 1880 meter. There are a couple of hotels in Vallouise, and perhaps more modern lodging up at the ski area called Puy-Saint-Vincent. We stayed at this place, the road there forks left just before entering Vallouise from the south. To the huts: This is a very popular area, expect a lot of people at the height of summer and on most weekends. The trail heads north from the parking, crossing a river on a nice bridge. 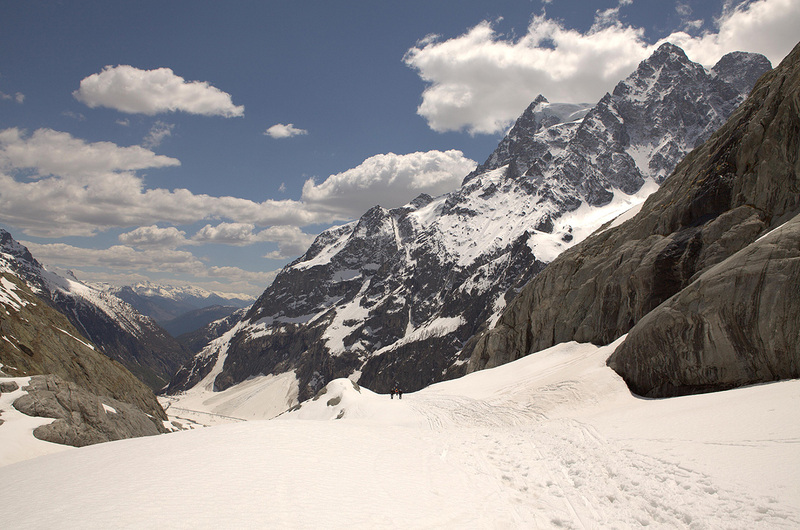 This trail is wide and well developed pretty much all the way to the first main hut, the Refuge du Glacier Blanc. After a few switchbacks, you arrive at a trailfork. The left fork leads up along the top of a moraine to Glacier Noir, our route forks right and continues with zig-zags climbing the face in order to reach a shoulder further up. From here, turn the corner and descend slightly to the river that can be crossed on a sturdy bridge. 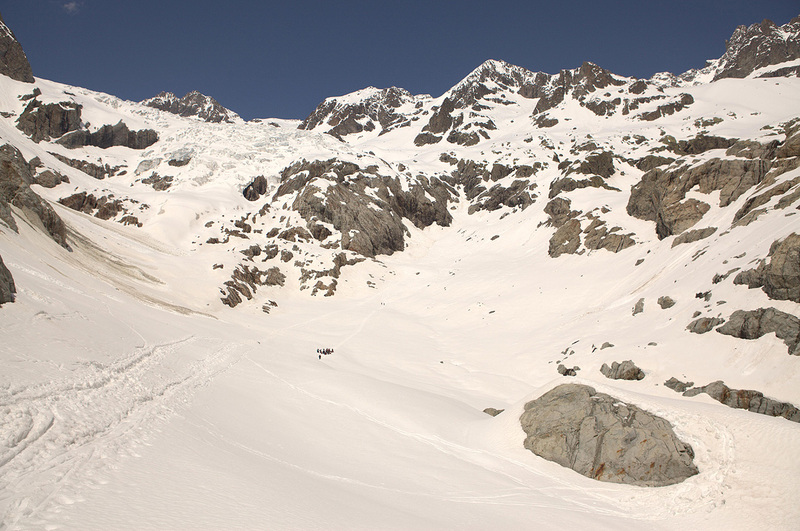 Next, the trail becomes slightly steeper as it gains the shelf above before heading more directly towards Refuge du Glacier Blanc. This refuge is located on top of a nice cliff, obviously commanding an excellent view back down the valley. 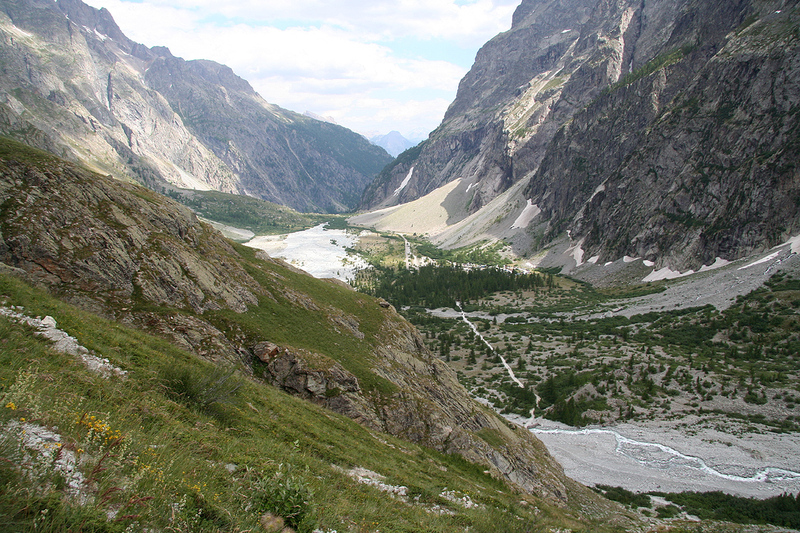 The trail climbs the lower slope, then ascends up and left of the cliff before a final, short (steep) uphill to the hut. This location is N44:56.242, E006:24.698, elevation 2560 meter. The refuge phone is +33-(0)492235024. 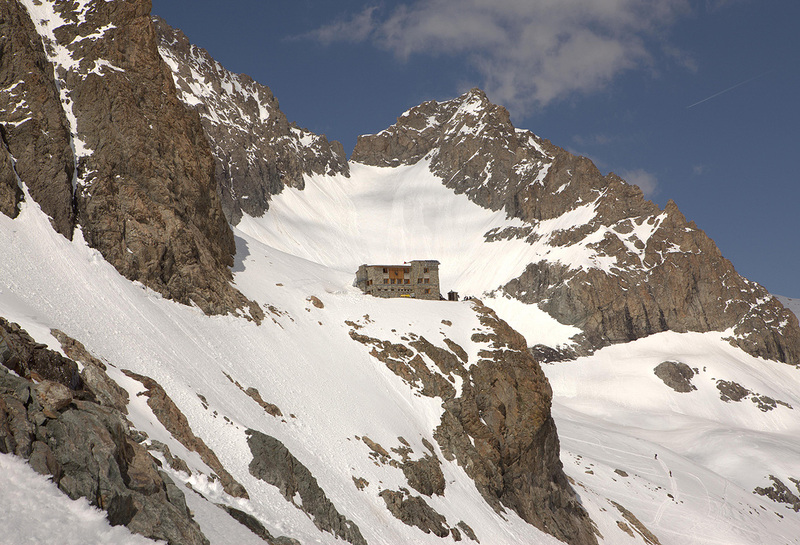 It is possible to stay at Refuge du Glacier Blanc, however, this makes for a long summit day. 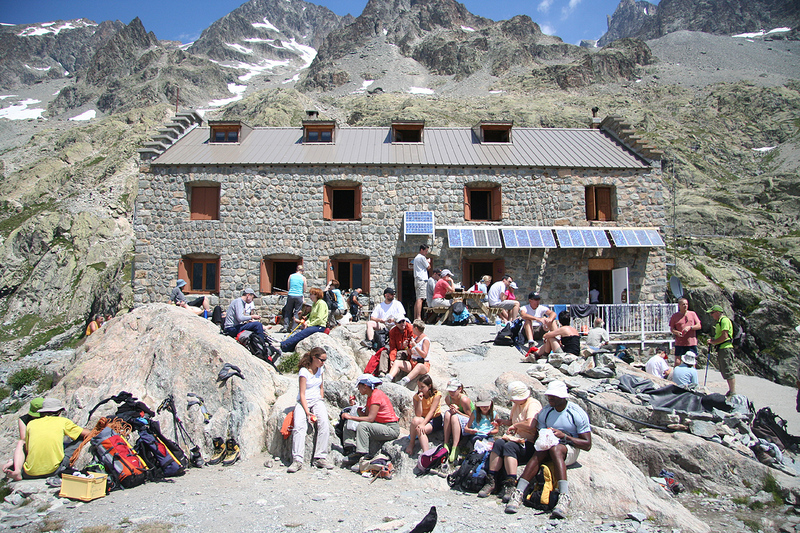 Most people try to get reservations at the highest refuge on the route, the Refuge des Ecrins about 600 meter higher. From Refuge du Glacier Blanc, head uphill along a fairly well marked trail (there are some variations). 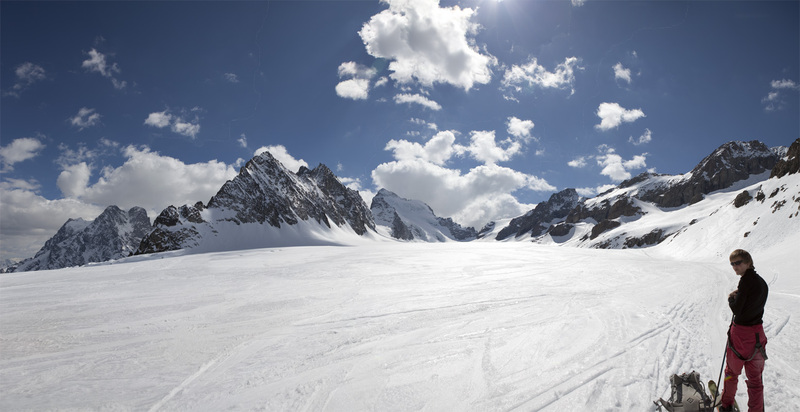 Higher up, the trail traverses high above the glacier in such a way that the route connects with the permanent snow along the edge of the glacier, as soon as the glacier has a more gentle slope. Continue on snow along the right hand side of the glacier, then gain the main glacier which is now pretty flat, and proceed until more or less below the refuge. You will then be at location N44:56.716, E006:22.884, elevation about 3080 meter. 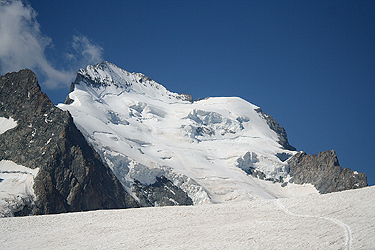 The refuge is situated high above the glacier on a cliff (the picture is taken in the opposite direction). 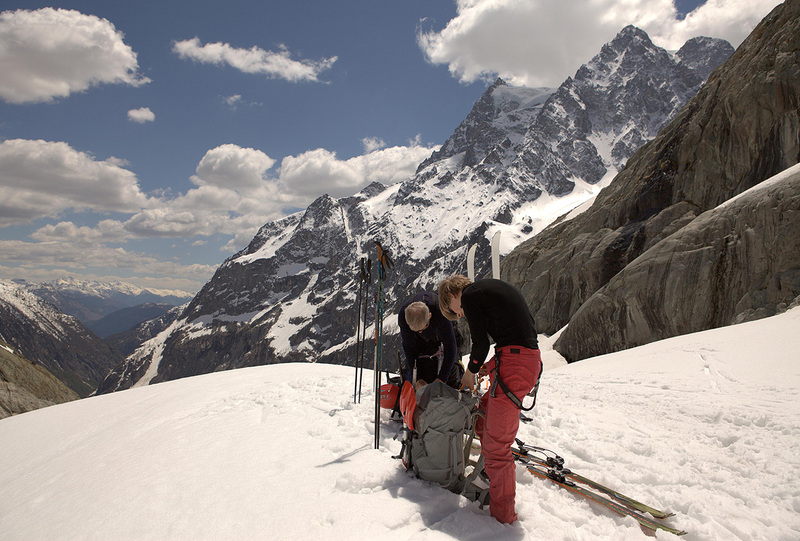 Thus the final ascent is somewhat steeper and one will need to descend this section before proceeding to climb Barre des Ecrins. The refuge phone is +33-(0)492234666. 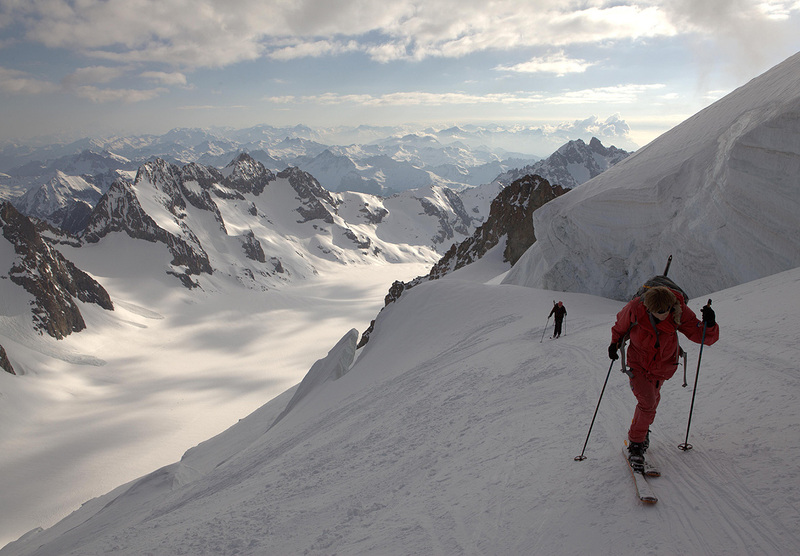 To the summit: The route continues along the almost flat glacier in an obvious way. 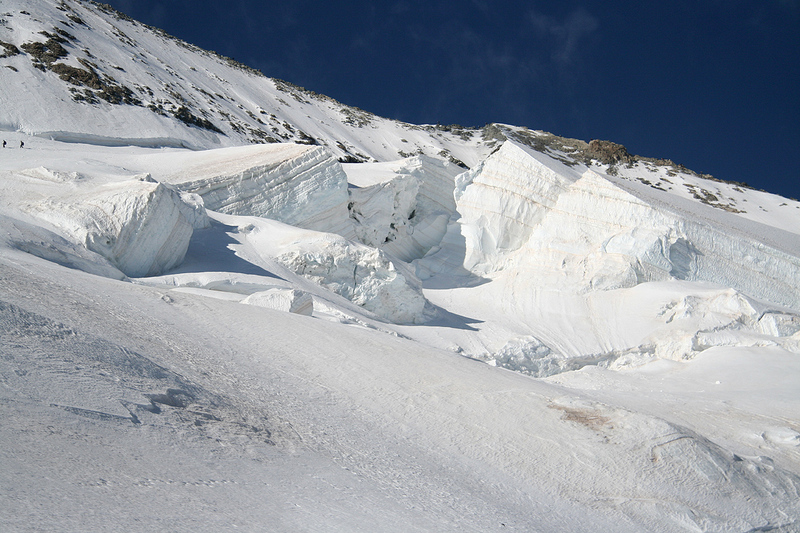 Just a bit beyond the Refuge des Ecrins, the glacier has a gentle uphill section and already here you may find some pretty serious crevasses. One should travel in teams and use a rope for safety. 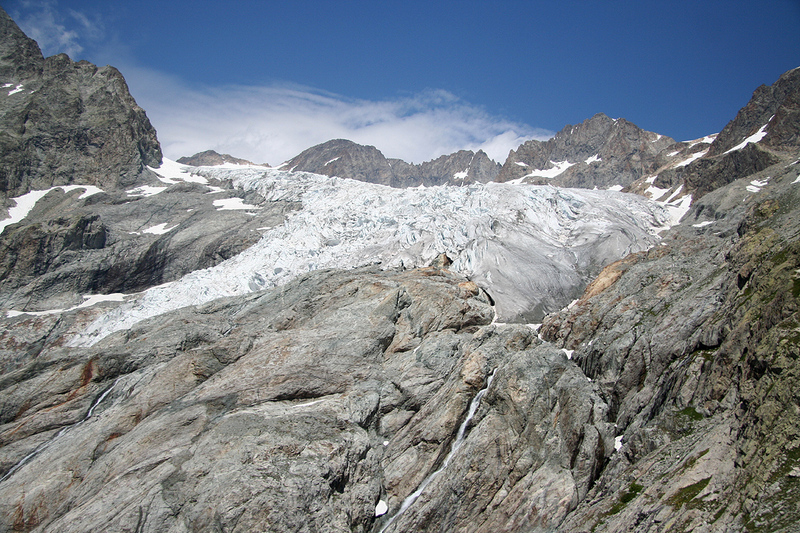 Further in, the big and pretty impressive icefall from Barre des Ecrins comes into view. 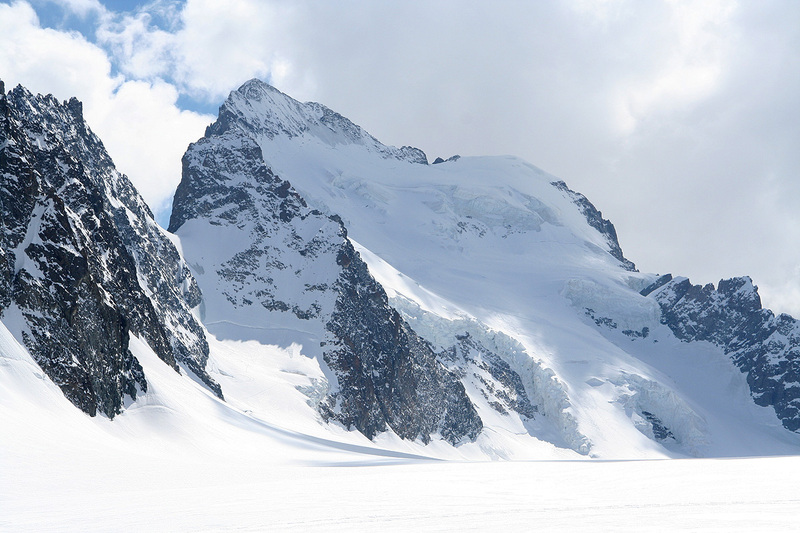 The normal route used to swing right towards a distinct col, then do an initial ascending traverse towards left (when viewing uphill), however, the danger of serac fall has led to an alternate route that climbs the lower section more directly head on. With this route, the lowest section of the big slope also becomes the steepest part. 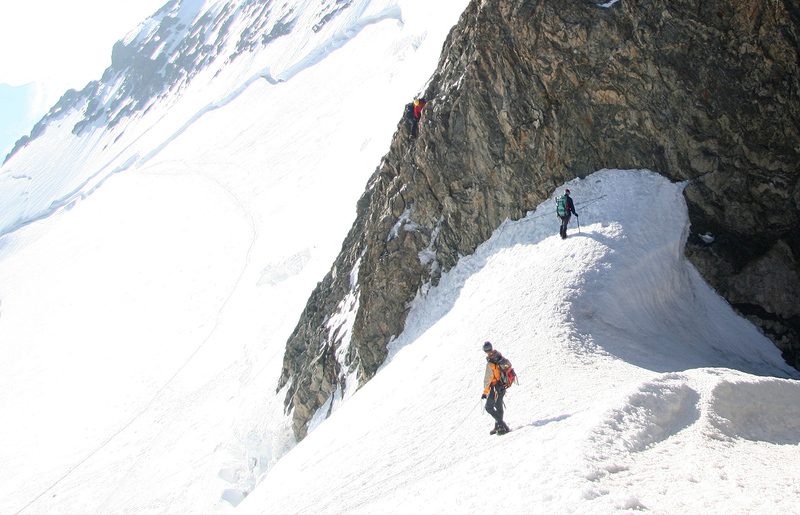 Follow the well established track as it zig-zags up the icefall. There are quite a few crevasses, but they tend to be pretty easy to detect. 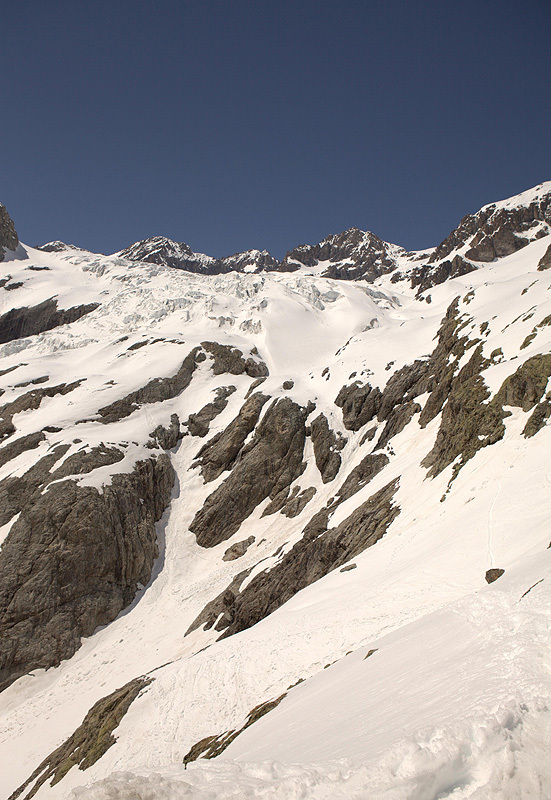 Higher up, the route will reach a somewhat more level slope that can be traversed (going right) until one arrives below the col named Brèche Lory. This last pitch can be steep, one may also have some trouble with the crossing of a bergschrund that runs pretty much at the same level. From here, one either continues up and across Pic Lory, this is the normal route to the main summit. 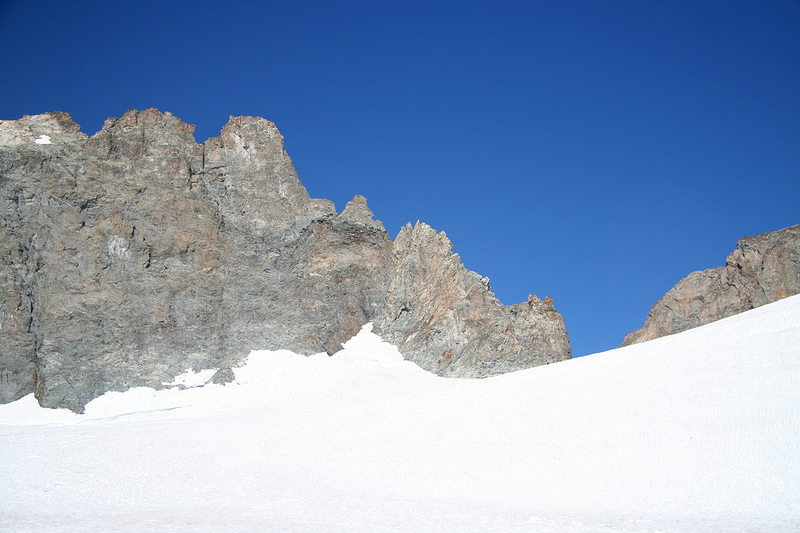 The access to this ridge may cross an icy section. This first part is the crux of the climb. 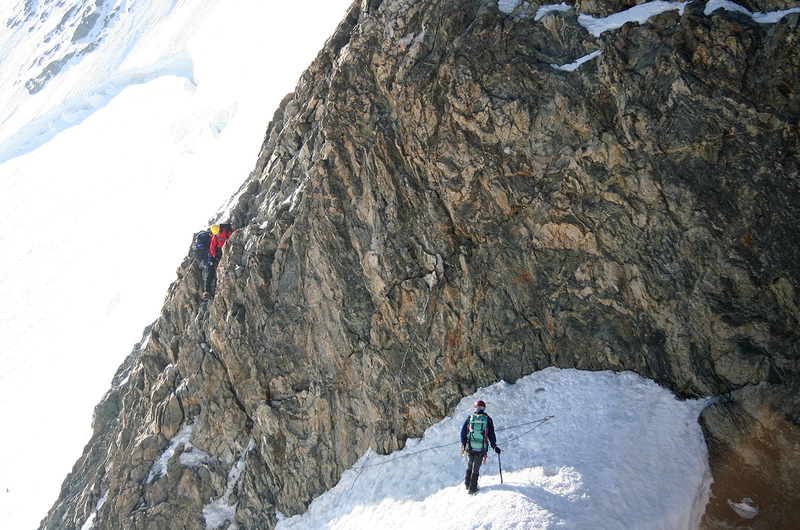 If the conditions are a bit unfavorable, this pitch requires ice screws and proper belays, ie. proper climbing. 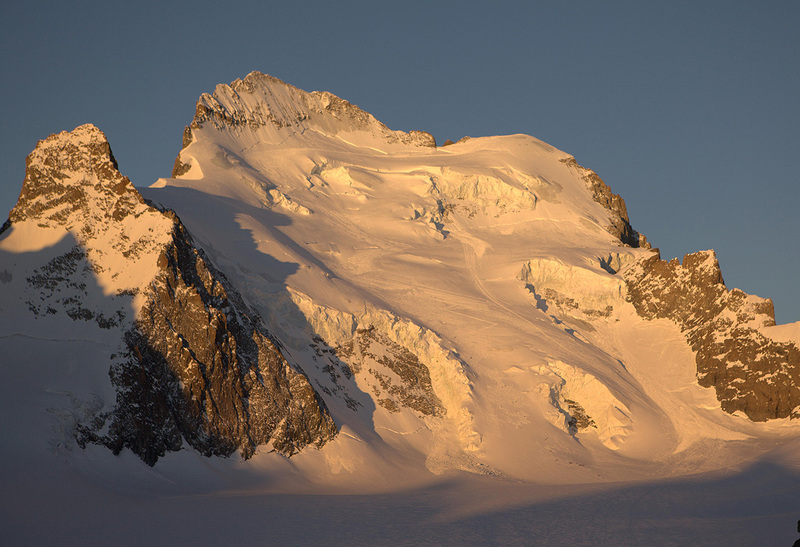 If one turns right, it is an easy matter to climb the subsidiary peak called Dome de Neige des Ecrins at 4015 meter. 1st. Attempt, July 13th 2009: We arrived in the Vallouise valley on July 11th. and quickly decided to establish (family) base camp in the ski area Puy-St-Vincent. 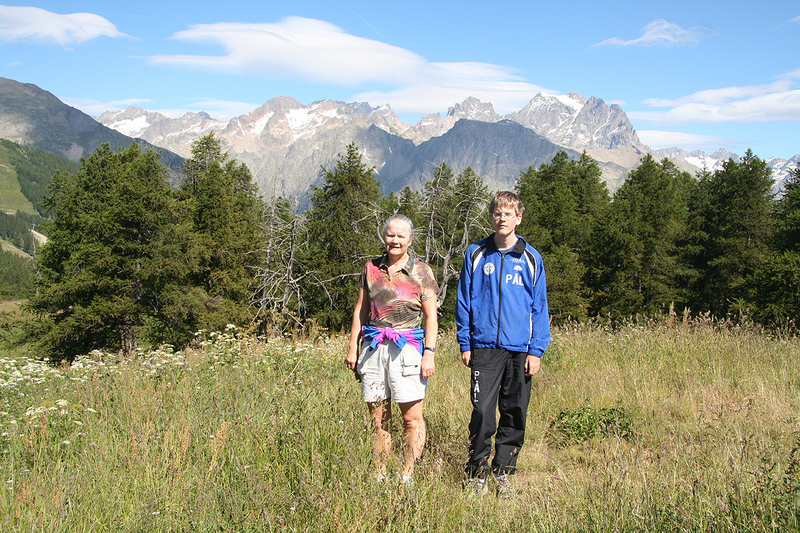 On July 12th, we first made a family hike to Tète de Orlac, 2093 meter. 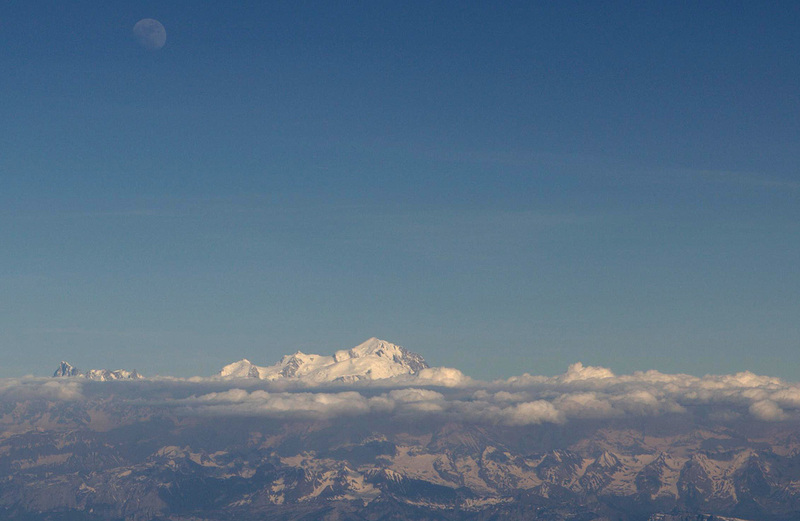 A very nice viewpoint, a beautiful mountain towards the west, and the eyecatcher, Mont Pelvaux, 3943m, due north. 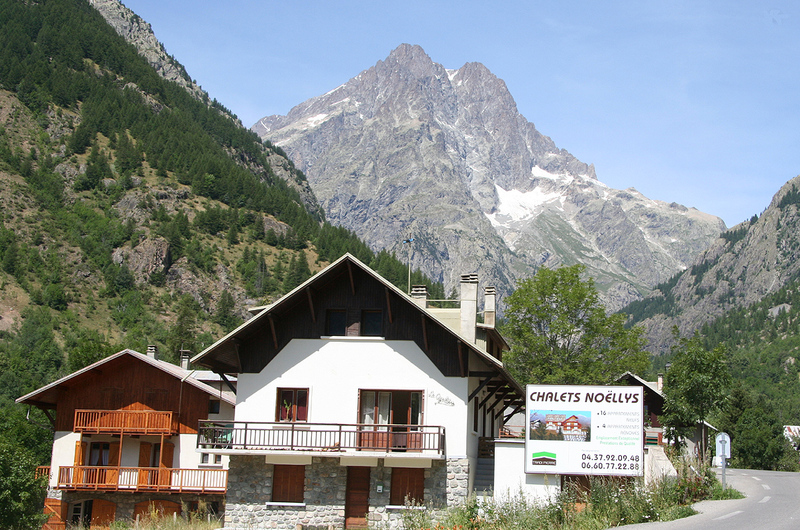 Perhaps even better, a very good view of the Vallouise village, and the general landscape at the base of the Ecrins National Park. We continued down to the local saddle and established that our local mountain had a prominence of approximately 89 meter. 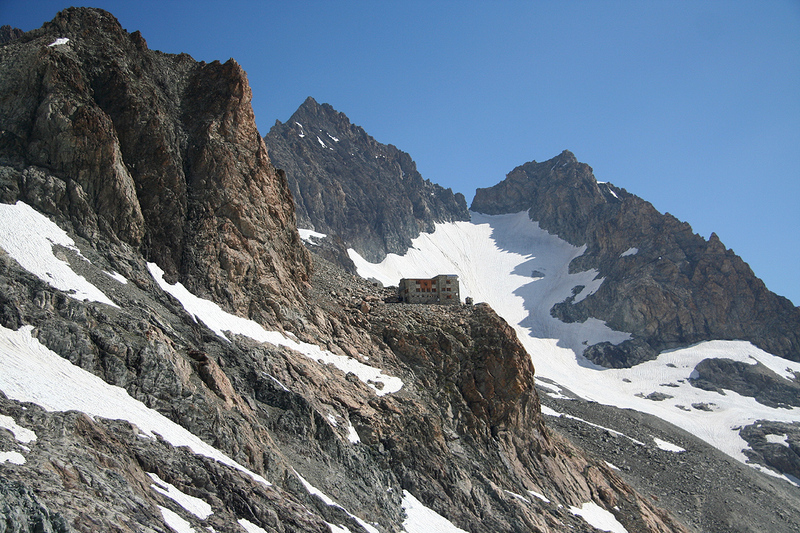 We were unable to get any reservations on Refuge des Ecrins and settled for the next best, a reservation at Refuge du Glacier Blanc. We started out from the trailhead at 1530 and made the hut by 1710. We immediately were faced with several unfavorable conditions. Upon arrival, Pål Jørgen and I noticed an attack of a stomach bug. I needed a toilet, while Pål did not feel like eating anything. 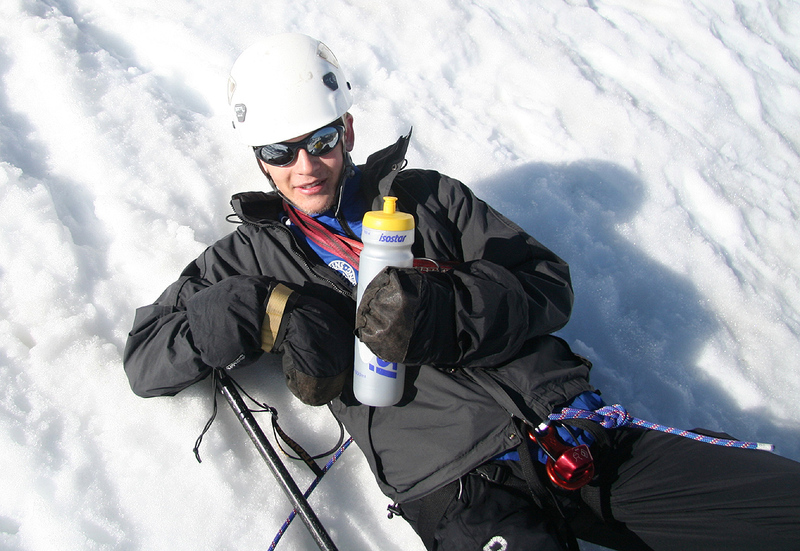 The result was pretty much the same, little or no energy reserves for the next day climb. We talked it over and agreed to still make an attempt the next day. 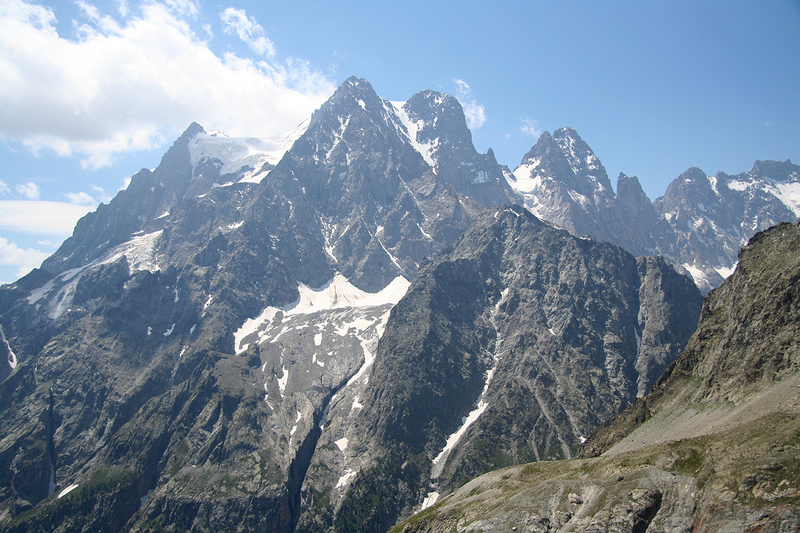 The other issue was our starting point almost 2 hours below the ones that started at Refuge des Ecrins. We ordered a pre-arranged breakfast by 0130, aiming for a departure at 0200. Waking up on schedule, we went downstairs only to discover that the breakfast had not been prepared. Not good, but we did carry some bread and salami that could be used as an emergency substitute. 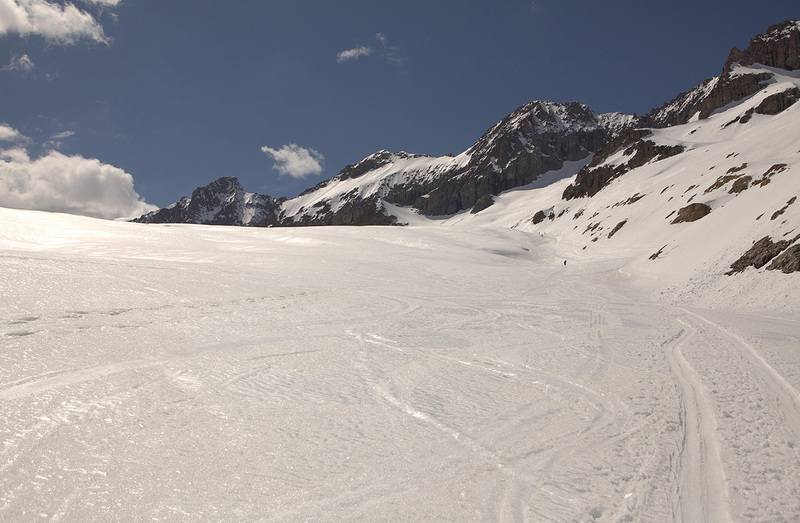 We left at 0205 and made good progress up the slopes and onwards on the glacier. Ascending in the dark, we noticed that we were the only party trying to climb Barre des Ecrins with a start from Refuge du Glacier Blanc. 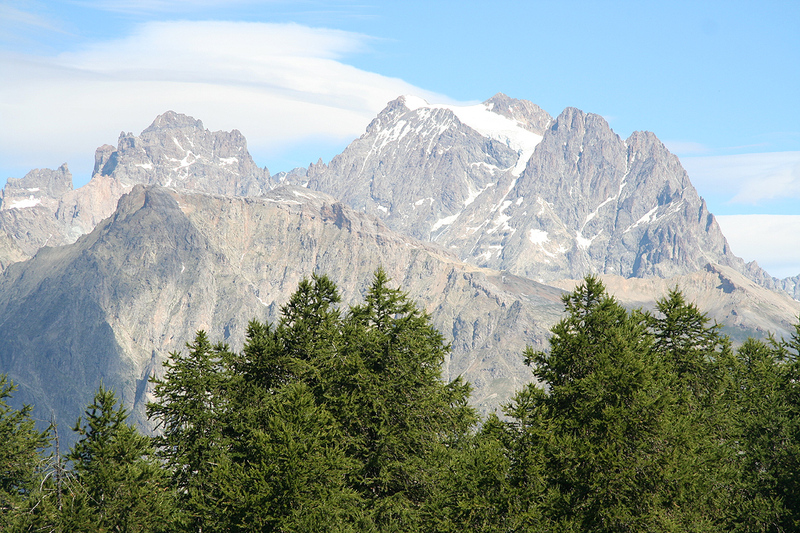 We arrived below the Refuge des Ecrins around 0330, noticing that a few teams had already started, while the majority were still desending from the refuge to the glacier. 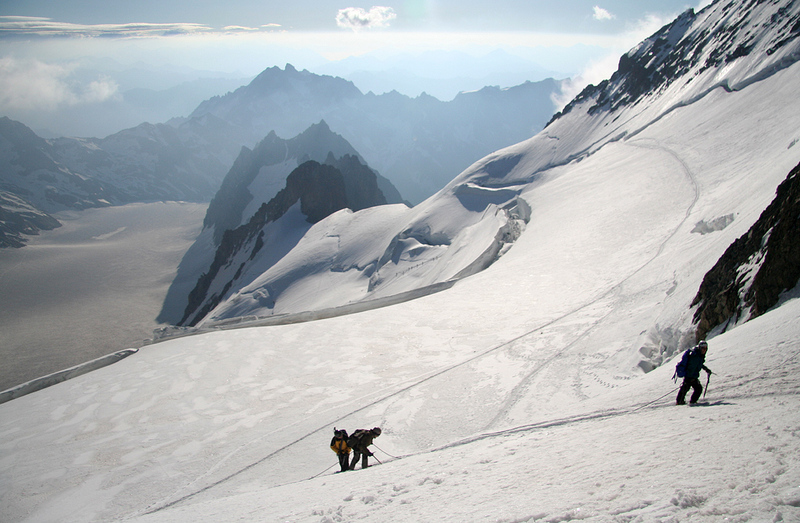 We roped up and continued towards the steeper part of the glacier further ahead. The route stayed left and climbed the steeper slope head on. This is not the normal route, but as the alternative seems increasingly more dangerous due to the seracs above, the route had been changed. It felt steep and I wondered how it would be to descend. 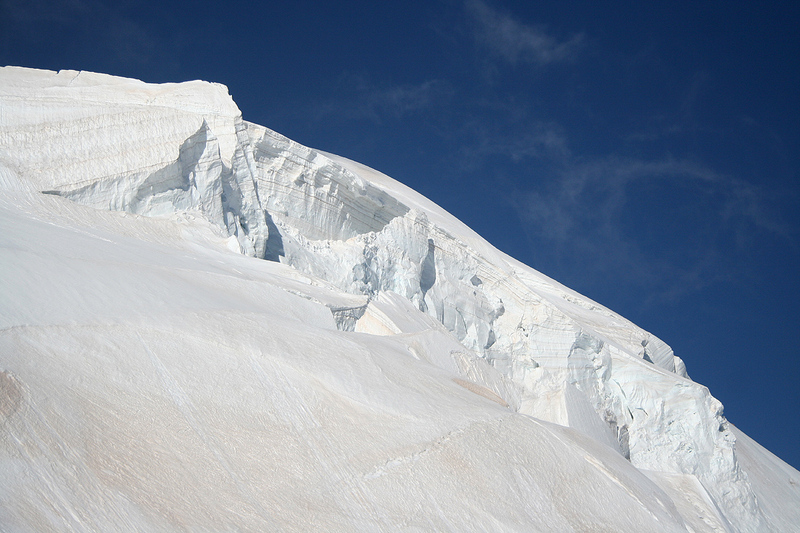 Higher up, the slope eases somewhat, but there was a pretty frequent pattern of new crevasses that had to be crossed. 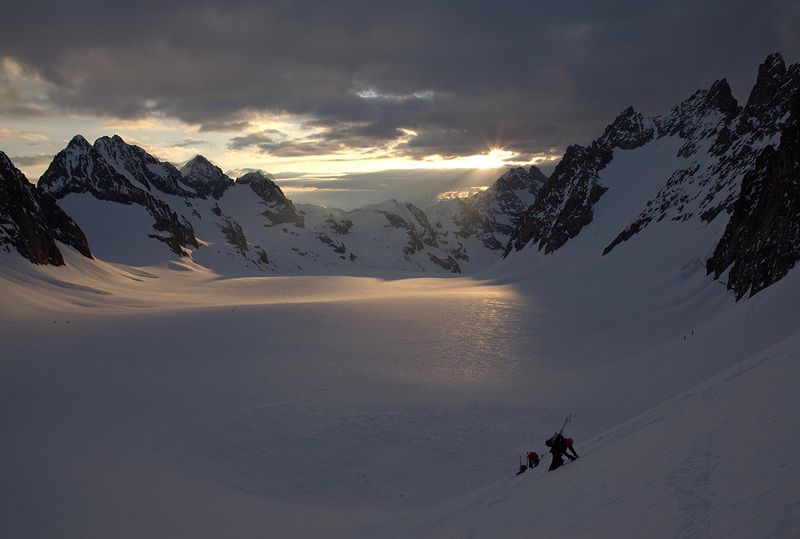 As we ascended the upper part of the glacier, the sun started to show in the east. We reached Brèche Lory well before 0700 with only one team ahead and a second team right behind us. Big surprise! 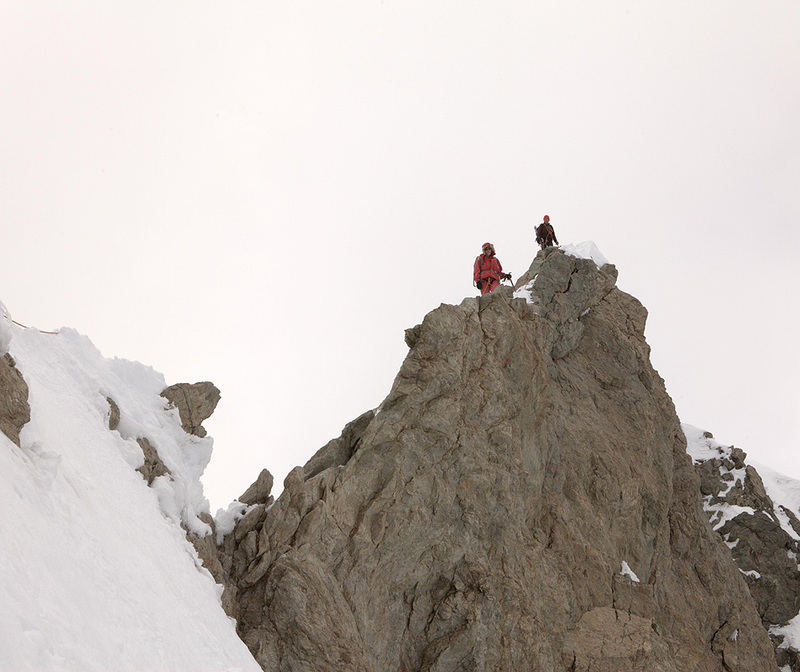 In order to access the ridge, one needed to traverse a pretty steep and completely icy slope. The entire approach looked pretty nasty. 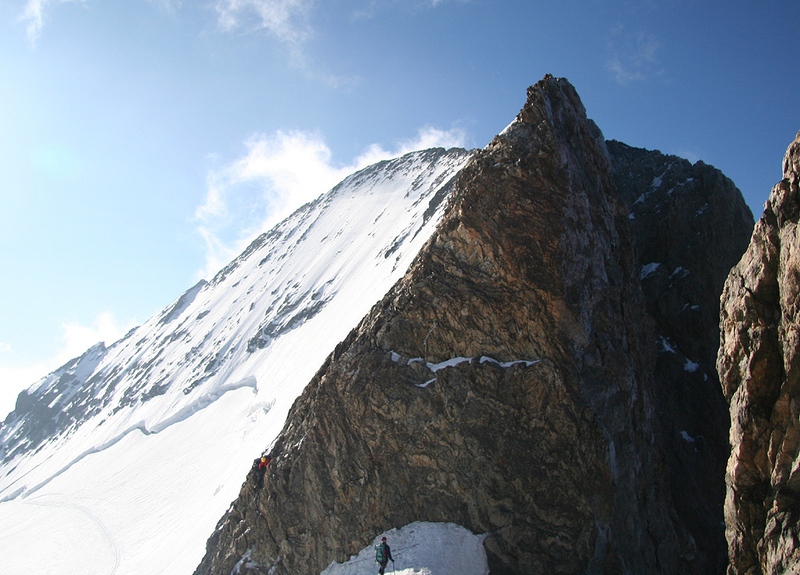 I had read that this route should be no more than UIAA II, a friend had also told me that the climb was not much more than a pretty straightforward scramble. Hmm. what we observed did definitely not look straightforward. The team ahead decided that belayed climbing was needed, the team behind us came to the same conclusion. 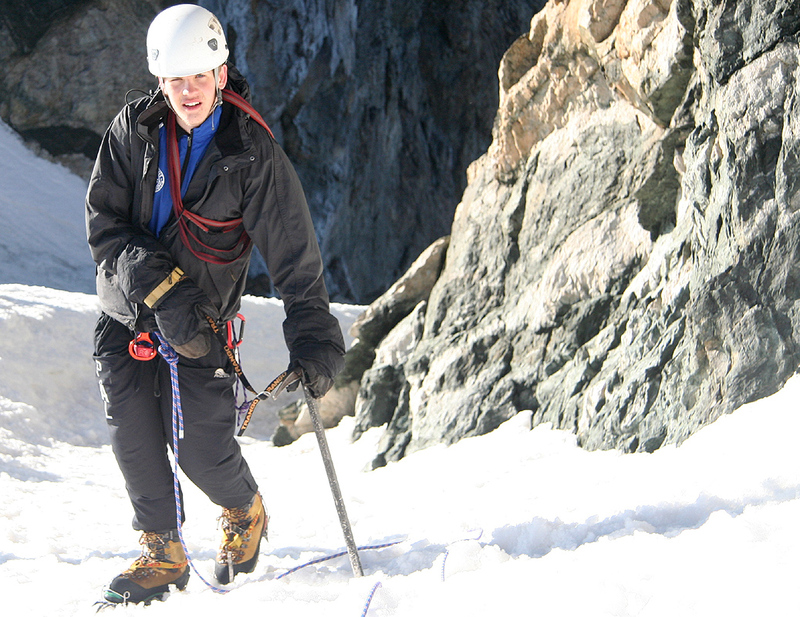 They went ahead to establish a secure belay stance by the use of good ice screws. Trouble was that we only carried a short randoneé rope, no ice screws and really no gear (biners etc) for a pitch of real climbing. We considered the situation for about 15 minutes while watching the difficulties of the first two teams. Pål Jørgen and I were in full agreement, this was not a pitch that we could tackle with the required safety given our equipment. 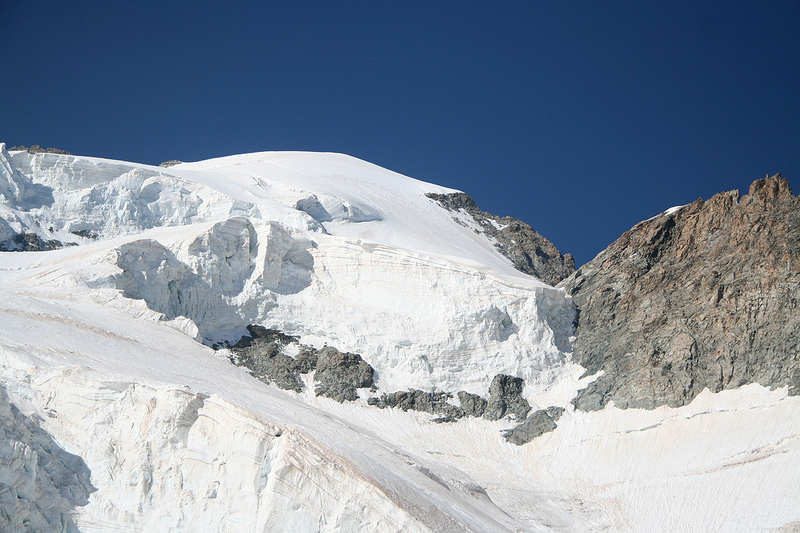 Too bad, after such a good effort, we being the only team that started from Refuge du Glacier Blanc. Having overcome our stomach problems, lack of breakfast, having climbed the steep glacier among the first teams etc. The weather was cold and windy with dark clouds, quite different from what one ideally should have around 0700 in the morning. We both needed our jackets and gloves. 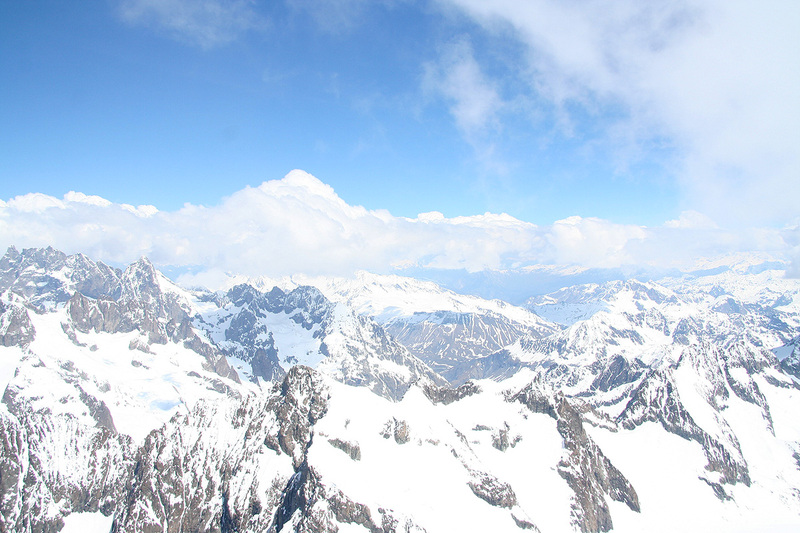 The decision was easy, we took a long look at the summit cross, close but out of reach, then turned and climbed Dome du Neige des Ecrins without any further problems. Clouds were drifting around, but the views were still nice. 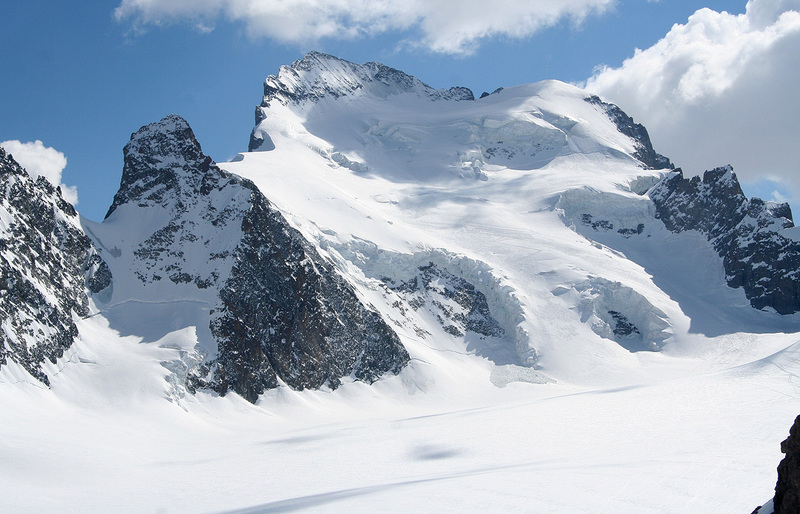 The nearby, somewhat lower terrain is quite rugged with sharp peaks scattered around. 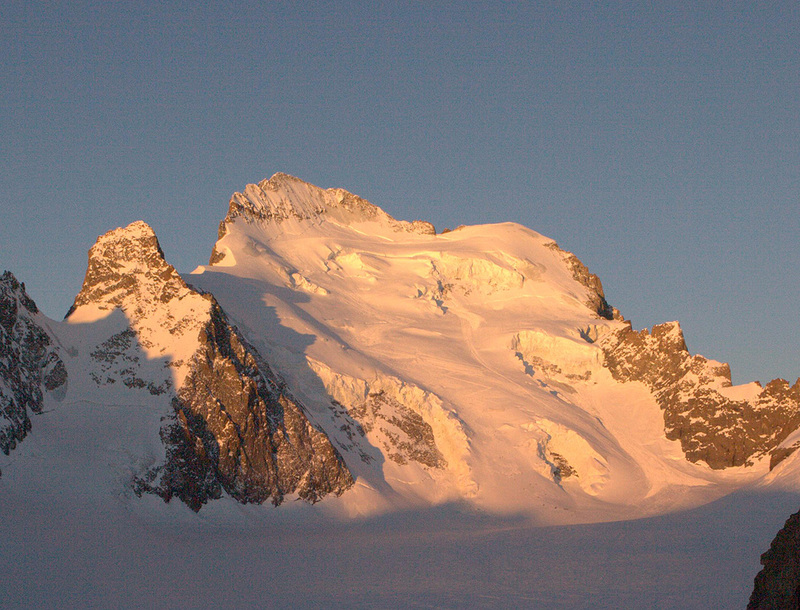 We had reached Col Breche Lory around 0645, left about 0700 and arrived at the subsidiary snow dome summit by 0715. We enjoyed the views and landscape until 0730 before heading back to Breche Lory in order to start our descent. 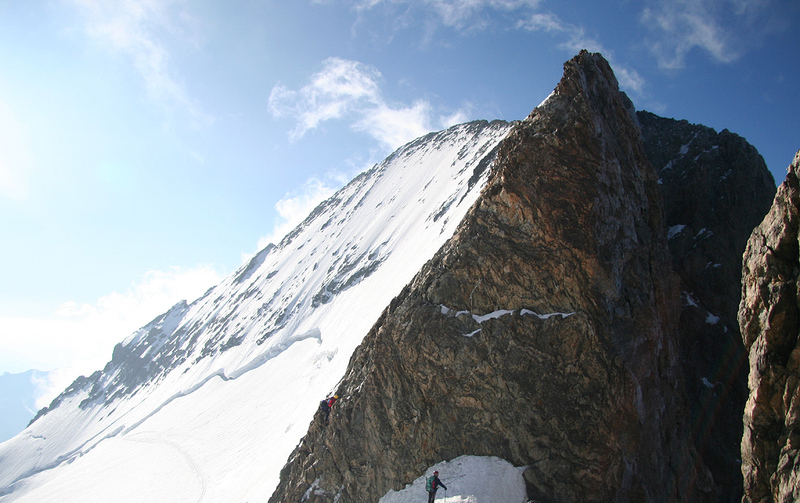 More teams were arriving, but most teams went directly for Dome du Neige without even considering the route leading towards the main summit. The descent went quite smoothly without incidents and the weather also improved greatly. The sun started warming, blue sky appeared and the clouds vanished. We made a long break at the flat area below the glacier and in a safe distance from possible ice falls. The scenery was dramatic and Pål Jørgen expressed his approval repeatedly. 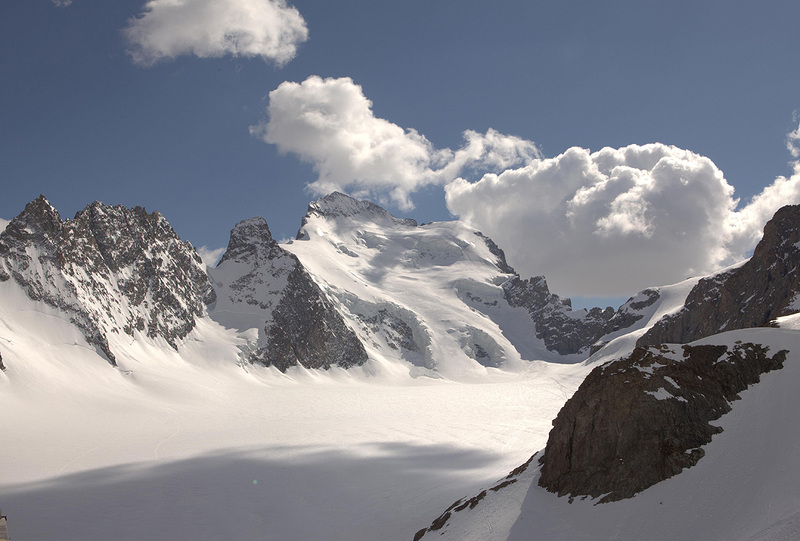 This was a true alpine place, the glacier was a real, substantial glacier, the peaks around were all good peaks etc. 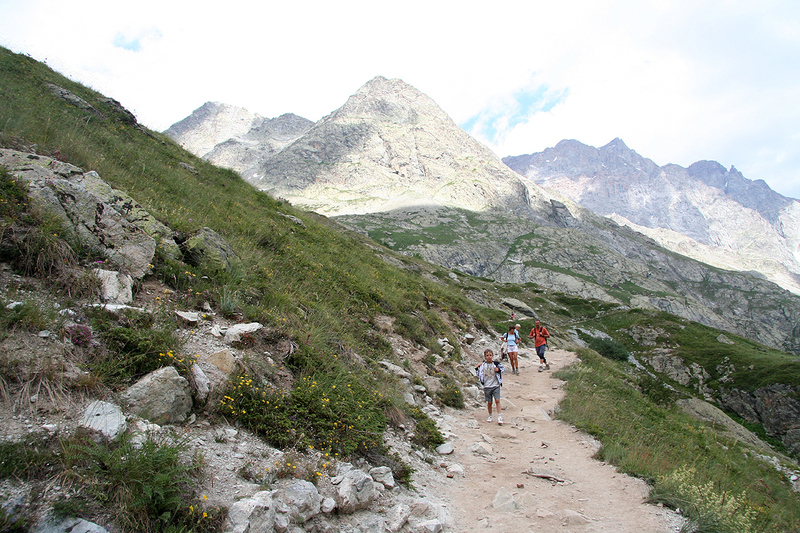 We continued our hike around 1000, and arrived back at Refuge du Glacier Blanc by 1145. Another long rest here, the weather was now perfect and the place was pretty crowded by day tourists from the parking area below. This is indeed a nice destination overlooking the valley below and with a good view to the receeding end of Glacier du Blanc. Perhaps even more impressive, the Mont Pelvoux, 3943 meter, right across the valley. We left at 1245 and hiked down to the car, arriving at 1405. Including ample rests, we had been on the move for 12 hours. Great to take the boots off and drive back to Heidi where a late lunch by the swimming pool carried our near future. We had learned a lot about this mountain and the route. Next time, when we return, we shall carry a climbing rope and enough gear to take the time required to access the ridge of Pic Lory. 2nd. Attempt, May 23rd 2010: A three day weekend (with Monday being a holiday), called for some action in the Alps. My friend Helge wanted to come along and my son Pål Jørgen completed our group of three. We flew to Geneve in the afternoon on Friday. With several hours of connect time in Amsterdam, we decided to travel to the city center and have dinner there. After getting round trip tickets from a machine, I asked a lady in an information boot about trains and she said: "The first train leaves in less than 2 minutes from track 3", we scrambled across and downstairs and jumped on the train as it was about to leave. In doing so, Helge mentioned that he had seen a sign saying that the train did not stop in Amsterdam? Well, too late to worry, the train looked promising as it stopped on a couple of stations in the outskirts of Amsterdam, but then continued directly to the city of Utrecht! We got off at Utrecht and quickly located a train that took us back to Amsterdam. Nice dinner at an Argentinian restaurant. The journey continued without further incidents and we stayed at a small, inexpensive hotel just south of the border to France. 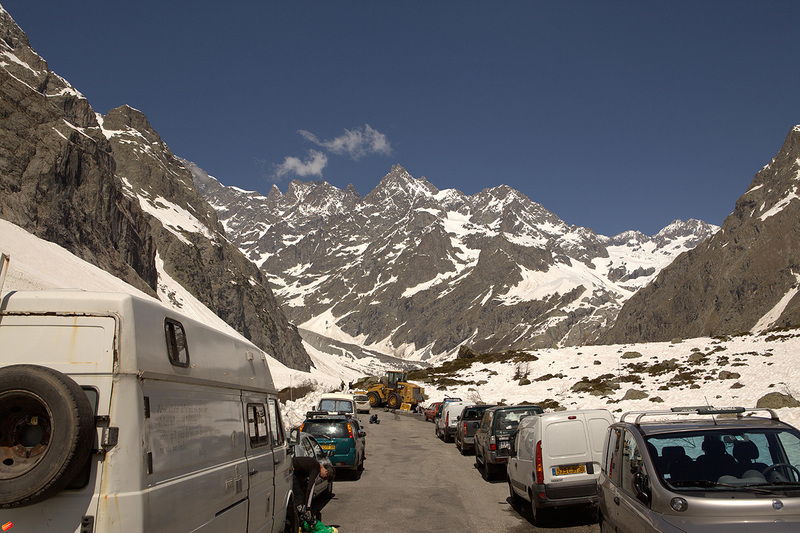 The next morning, we started driving around 0815 and then discovered that the mountain pass Galibier was still closed by snow. We quickly decided too drive through the tunnel on E-70 leading into Italy. Euro 40 in toll for a return ticket, this road was quite ok and we got back into France across a smaller mountain pass and then to the city of Briancon. We passed the small place of Ailefroide and got up most of the hills before the road was closed by snow perhaps one kilometer before the parking at Madame Carle. We parked along the road in an area full of parked cars around 1145. The location was N44:54.658, E006:25.838, elevation about 1829m. 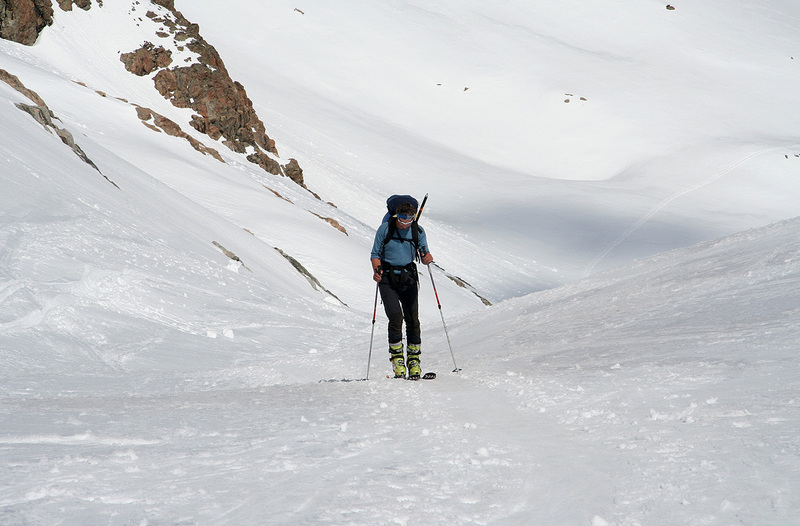 Leaving at 1215, we carried the skis up the first hill and found permanent snow just as the trail reached the shoulder that leads into the basin below the first Refuge du Glacier Blanc. From here, we skied directly up a somewhat steep gully that tops out just behind the refuge. From here, we had a good view further uphill to the glacier that is accessed via a climbing traverse on its right hand side. 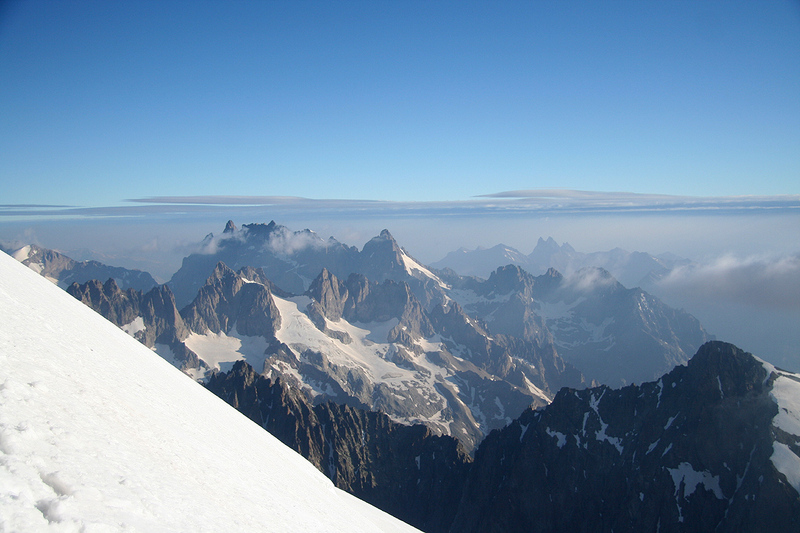 Leaving the valley behind, we now get onto more gentle terrain and as we gain elevation, the final part comes into view with Barre des Ecrins as the final stop. 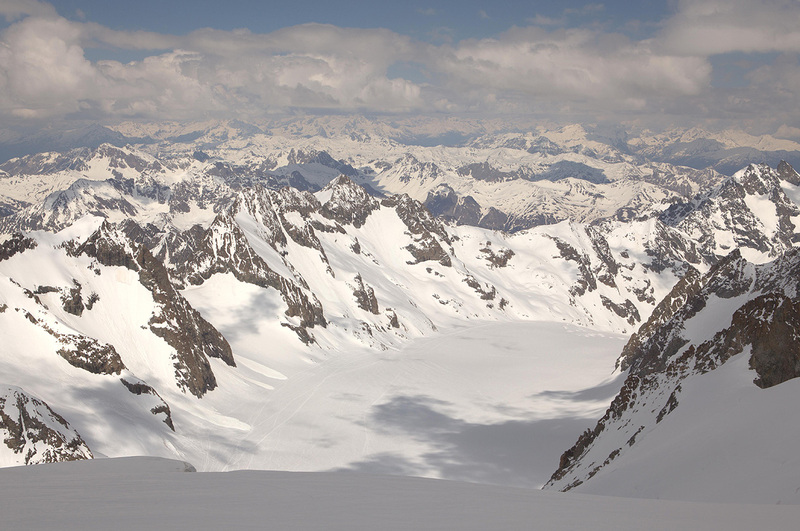 From Refuge du Glacier Blanc, the route is similar to the summer route. 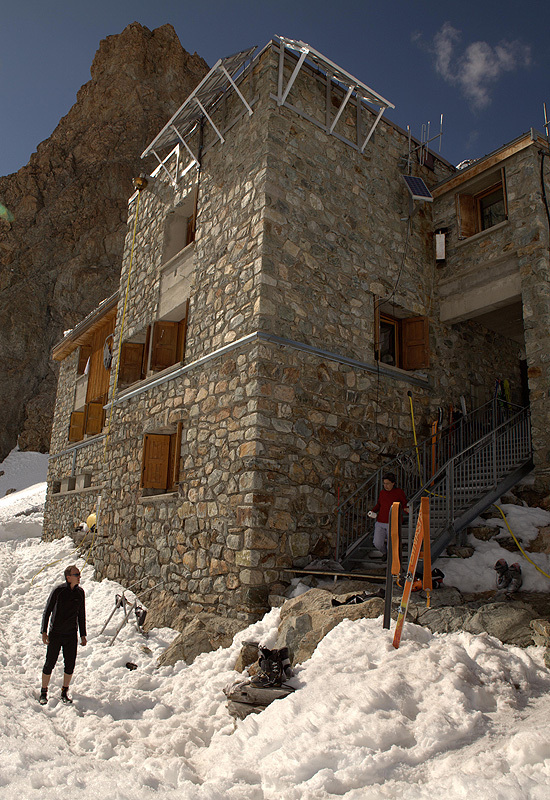 We arrived at the Refuge des Ecrins around 1700 after a very nice climb on skis. 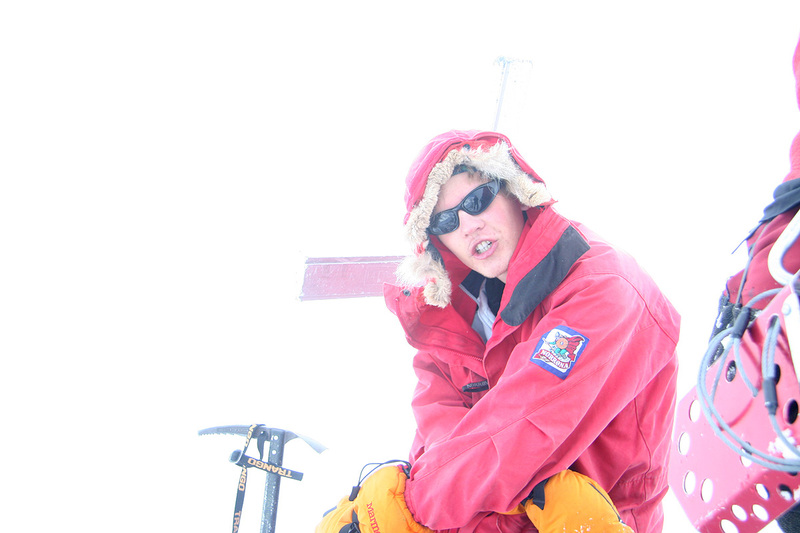 Getting up at 0400, we were down at the glacier and ready to ski by 0520. We skied the same route as we had walked previously, rather steeply up the middle in order to avoid the serac danger that exists if one follows the "normal route" that traverses right to left up a somewhat more gentle slope. The sky had scattered clouds, but also sunshine and no wind. We (at least I!) skied rather slowly and it took time to reach the traverse just below the summit rocks and the big crevasse that runs parallel just at the upper end of the glacier. There was only one crevasse further down with a solid snow bridge in the middle. We located a snow bridge crossing the crevasse just below Pic Lory, thus providing access to the (steep) slope that leads up to the small col between Pic Lory and the main ridge of Barre des Ecrins. 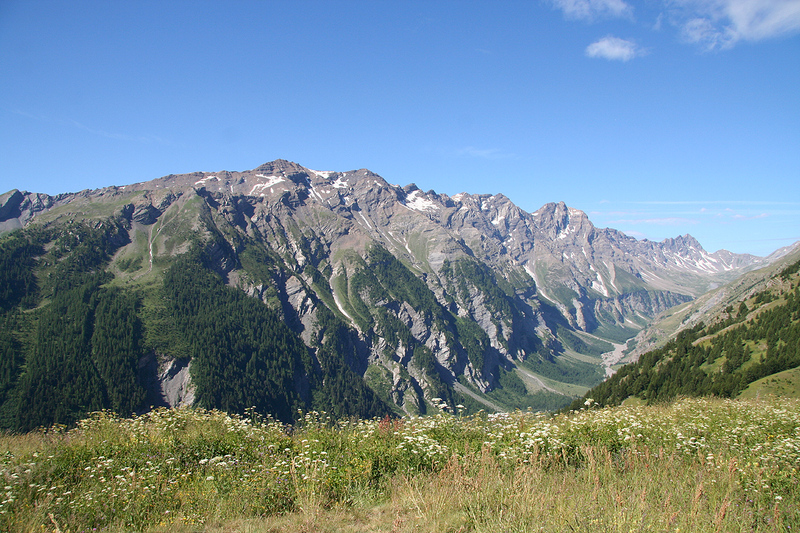 In this variation, one avoids the first section of climbing that starts from the col Brèche Lory. 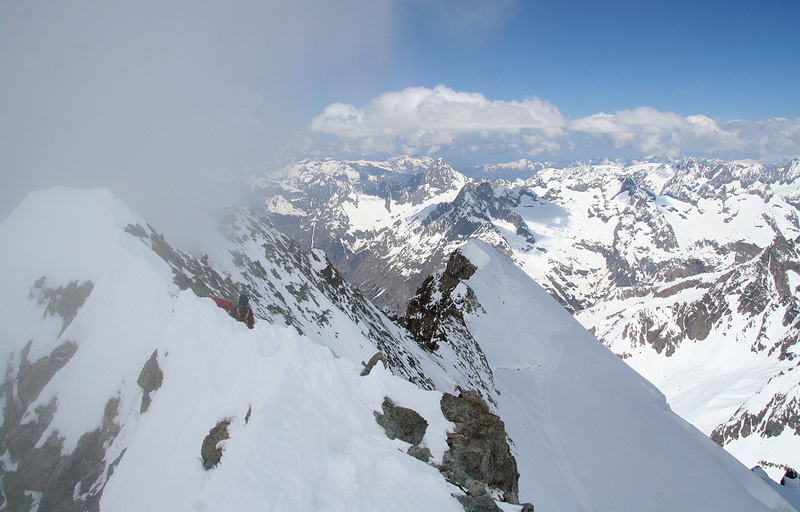 However, this slope was icy under a thin layer of snow and required 45 meter of belayed climbing in order to reach the main ridge. 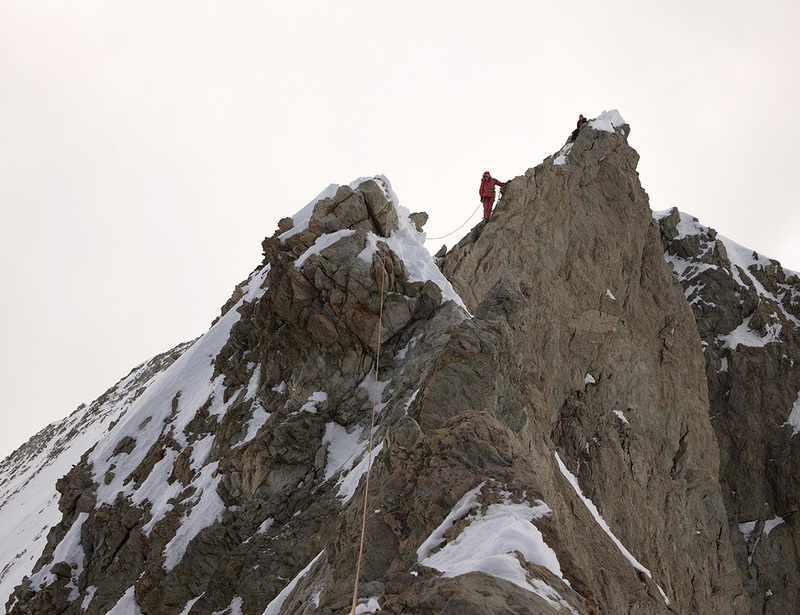 We similarly used the rope and a rappel on our return when descending. We proceeded to climb using running belays along the ridge. 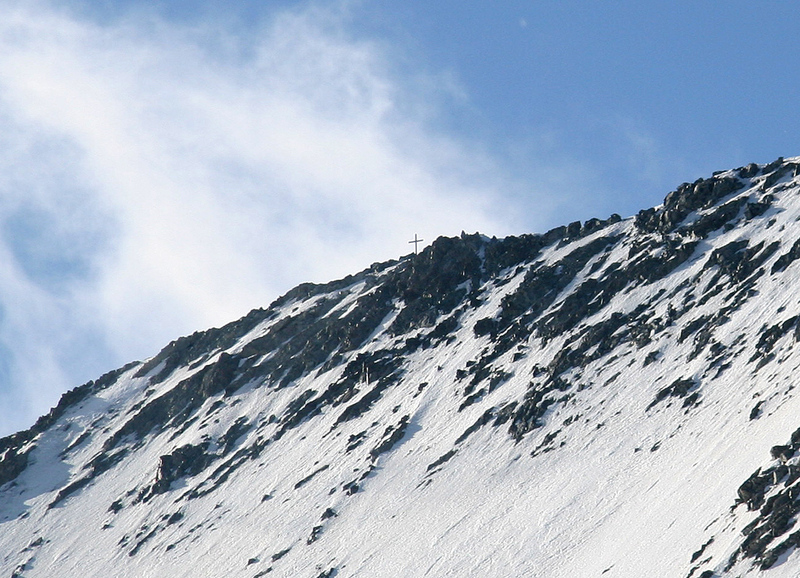 This ridge first leads to a false summit, then slightly down before ascending gently to the cross at the main summit. The section just before the false summit is very narrow and has great exposure. 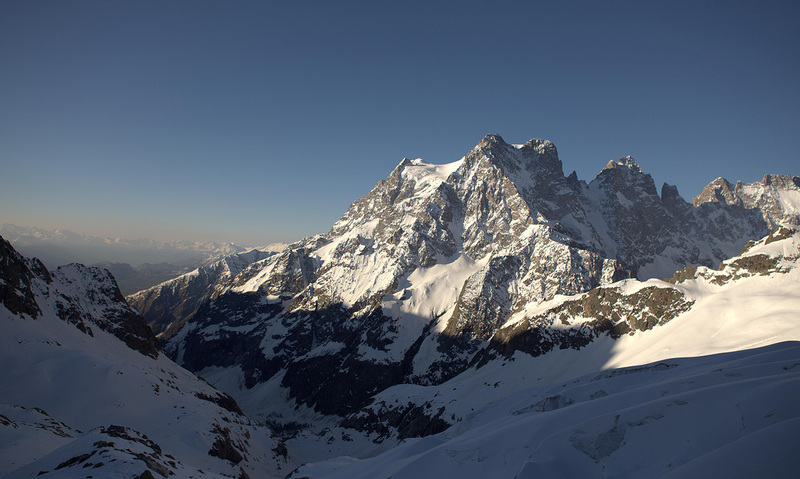 For about five meter, the ridge is only about one centimeter wide, providing good handholds as you climb along its left side. We stayed exactly at the top of the ridge all the way to the summit with mixed conditions. Snow and ice in combination with rock pretty much all the way. It is possible that this route looks a bit simpler under dry summer conditions. 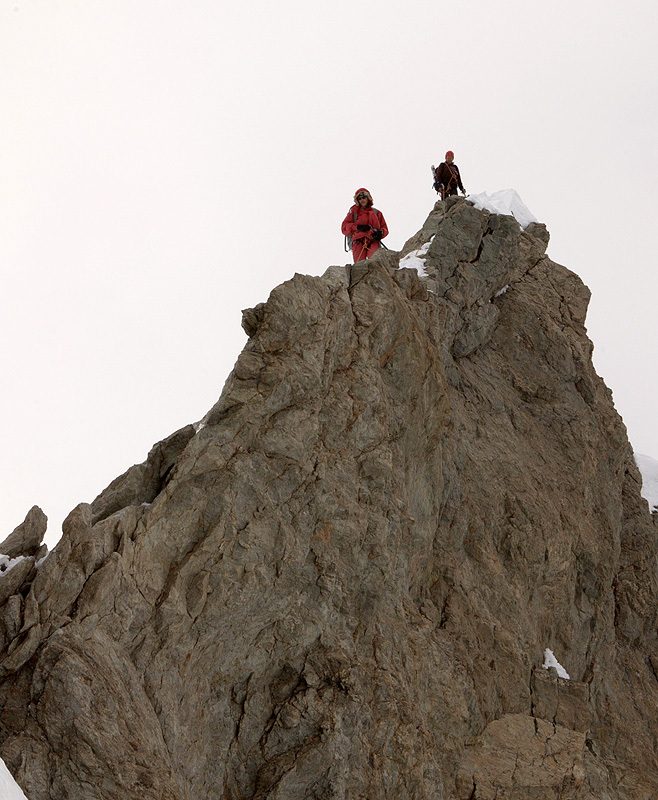 No big difficulties, but a long and sharp ridge (photo from summit) that required our full attention. I would rate the climb as a pretty hard (YDS) class 4 route, corresponding to a PD+ rating on the Alpine scale. The ridge climb required a couple of hours and we arrived at the summit at 1145. 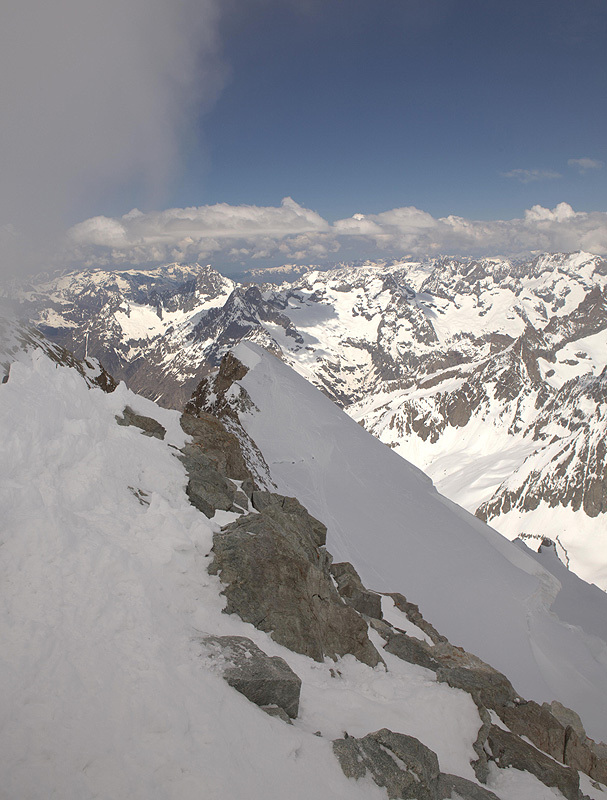 Another team had climbed the face directly to the summit. They were busy setting up the first return rappel from a big rock at the very ridge, this resulted in some minor traffic jam in an area with limited real estate. 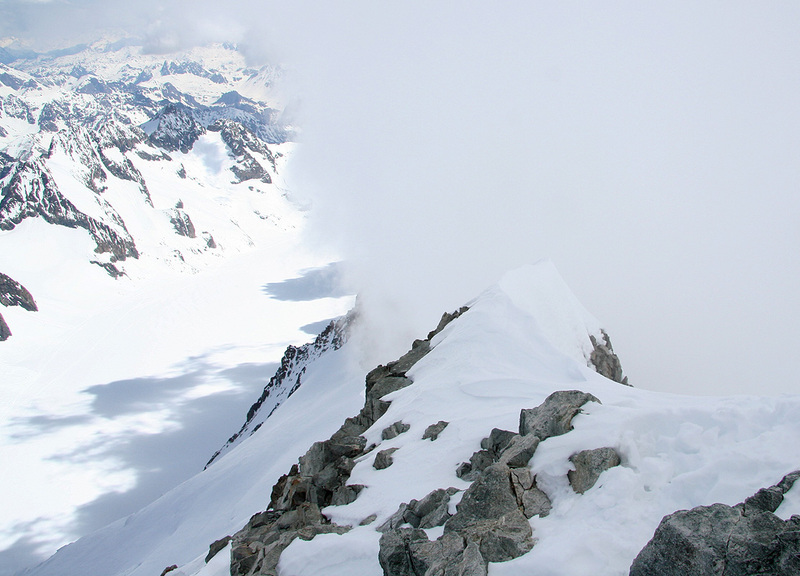 Unfortunately, we had a local cloud descending on the summit just as we were there. The views to the north and east were still fine. Since a lot of time had already been used, we started our descent around 1200. Carefully retracing our steps we got back down to the skis and a rather long and steep downhill slope. We returned to the refuge at 1645, a long day, we were all pretty exhausted and needed a rest before dinner at 1830. 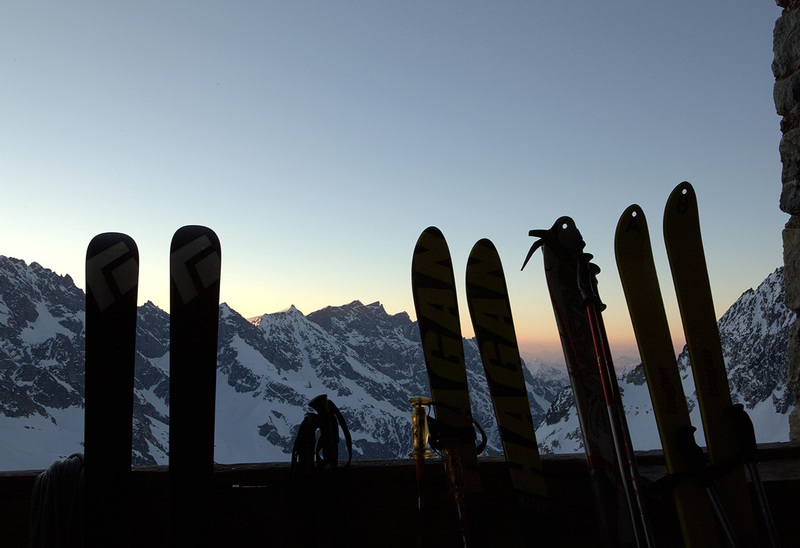 We stayed a second night, got up at 0600 on Monday and started our descent on skis around 0700. 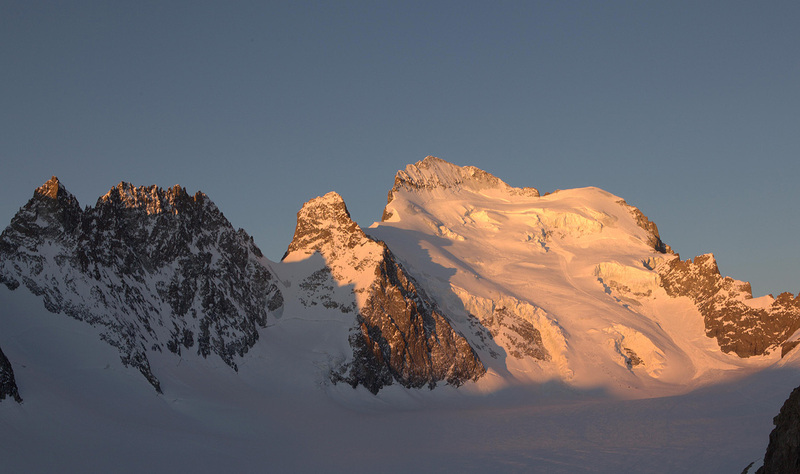 The day was perhaps even better than yesterday, Ecrins is glowing in the morning light. This return trip was pretty uneventful, the weather was absolutely brilliant and we all had a good time before reaching the car around 0930. We started driving by 1000 and stopped for a nice lunch in Aix-les-Bains before hitting the airport in Geneva around 1600, about two hours before our flight at 1800. No more to report, we landed in Bergen around 2230 all with memories of a very successful weekend trip to the Alps. Barre des Ecrins as seen from Col du Galibier. The trailhead as seen from partway up the first section of the trail. The beginning of the ridge across Pic Lory. 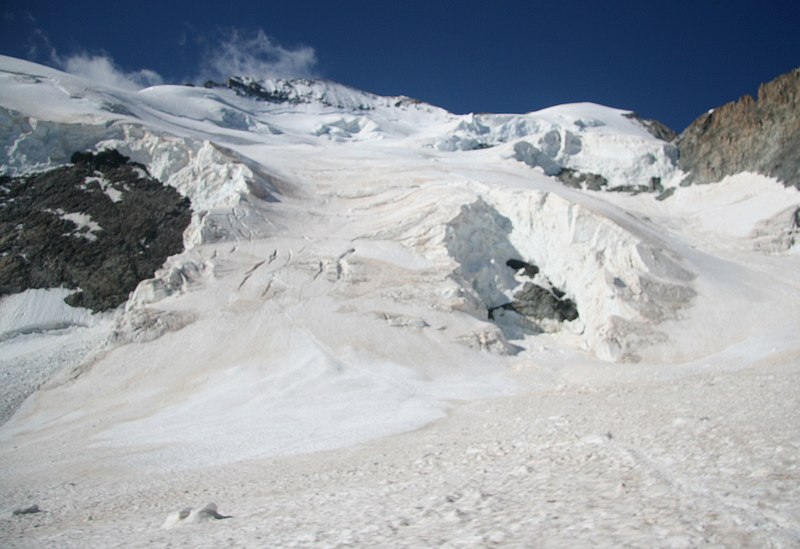 The glacier, several people on the route (great detail). The summit, we did not have much space. 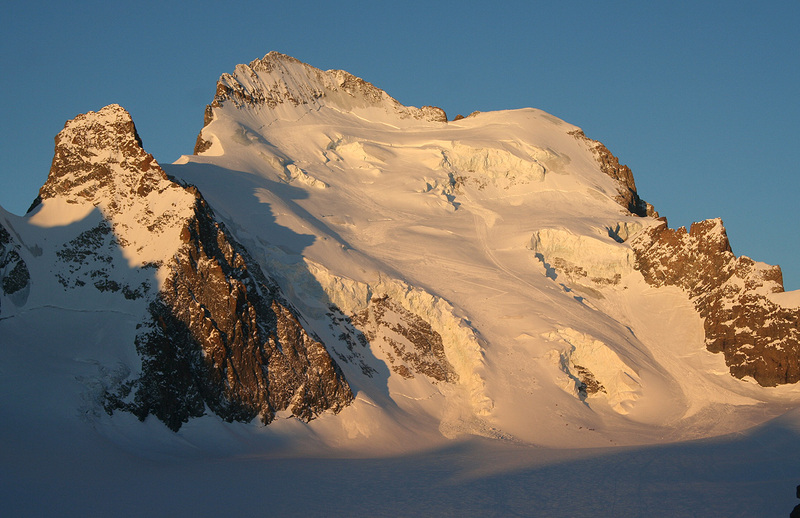 The west ridge, as seen from the summit. 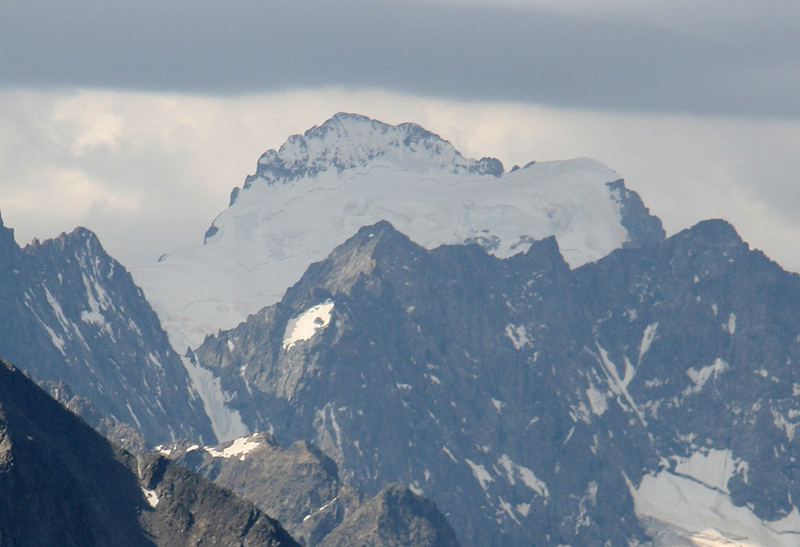 The east ridge, as seen from the summit. 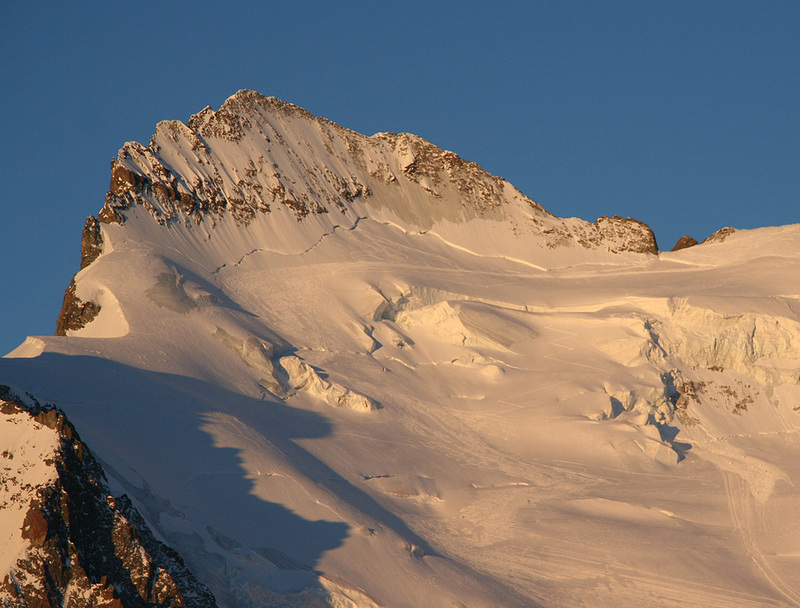 Barre des Ecrins, May 23rd, evening. The avalanche just left of the route came around 0700 this morning. 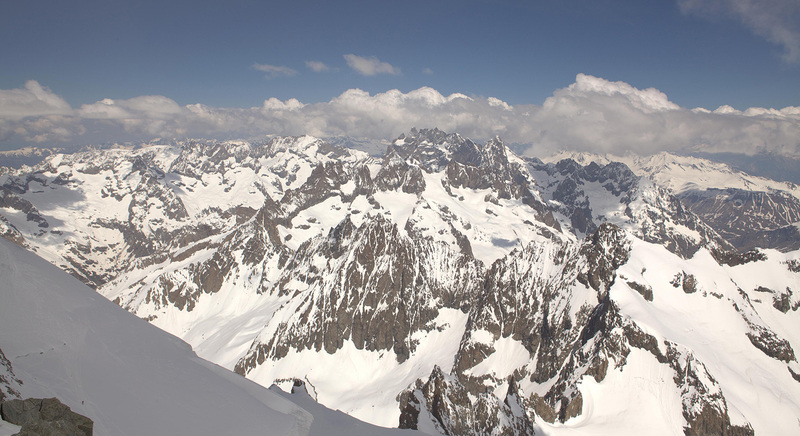 Barre des Ecrins, May 24th., early morning. 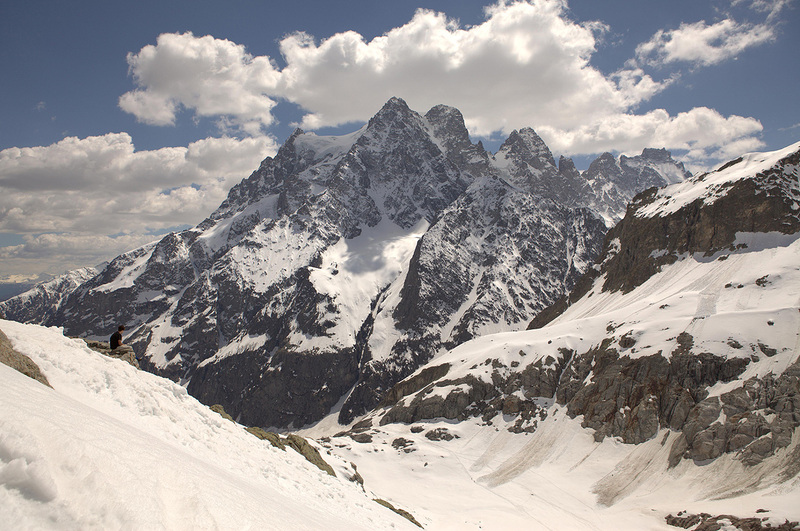 Barre des Ecrins, a closer view of the top.